Ever wanted to enter the world of stock market trading but you feel that it will be onerous for you because starting up is a bit of hassle? It is about time that you start to discover the world of mobile trading to take the stock market trading into your own hands. This is also one very smart means to put your smartphones to more productive use. With the rise of the smartphone also comes the evolution of many platforms including the birth of mobile trading. Mobile trading is being favored mostly by small-time investors because accessing the stock market is not going to be much of a struggle because of the readily available smartphones and a cheap internet plan enough for you to monitor the comings and goings of stock movement. The basic tools that you will need aside from a smartphone is a reliable broker for your trading account, the broker’s trading app, the basic trading know-how and then you are already good to go. The stock market has then become very accessible and efficient. Another great way for you to earn that extra income at your fingertips. To be clear on what is mobile trading, it is a means of trading that you do by just using your smartphone or your tablet. The essence of mobile trading is embraced in two views – literally because you are actually just using your smartphone in dealing with your stock trade, and figuratively because you can do stock trade anytime, anywhere. With the aid of mobile trading, you no longer have to be stuck in one place just to monitor your investments because whether you are on vacation, at a coffee shop or just running some errands, you can always check on your trade position. With that, not only will you be able to check on account balances or stock price movements, you can already take action on whether you will buy new stocks and grow your equity or sell your stocks for profit. It is pretty much easy to set up your mobile trading account, you will just have to follow the required information and the necessary documentary requirement that some brokers might require you to submit. Of course, if you are still new to mobile trading you will also have to familiarize the ins and outs of the mobile trading app that you chose so that you have it personalized according to which industry you would want to invest your money, and as to the method of buying or selling stocks through the app. With a simpler approach in the stock trade, you will then be able to determine how you would want your equity to grow and what will your goals be from such investments. It is important for you to have that goal-setting because this will help you be more motivated in making the smart decision on your stock positioning. Little by little, you will eventually notice that you have already been reaching milestones with nothing but your smartphone on hand. To be able to fully appreciate stock trade and more importantly get the most out from your investment, you must be very diligent enough to research on what mobile trading app fits you the most. Because the truth is, these mobile trading apps are not a one size fits all, so for you to be able to realize what you want with your investments, you also have to make sure that the broker and the mobile trading app that you are using matches with your objectives. Once you know how you will foresee yourself in the world of a stock trade, then you should also start considering the amount of risk that you might want to take. If your risk appetite is low, then you should start placing small amounts of money until such will grow without you frantically checking if the stock market is either going well or not. This platform is the best overall stock trading app experience and is one of the prime brokerage firms in the country. This platform offers a number of mobile applications each of which can cater to your needs. The TD Ameritrade Mobile app is available in iOS, Android and Windows phones. If you are still a beginner and want to trade in a more passive manner, there are a lot of offers that can suit your requirements. You will also be able to modify your dashboards, screens, access research and advice, fund transfer and many more. Robinhood came out first with their mobile app before launching its website making Robinhood one of the best stock trading app in its own right. It may not offer you to full range access of investments, Robinhood still works great for stocks and ETFs. Robinhood also just recently added Bitcoin as one of your investment options. One of the fundamental features of this app is that you will be able to keep track of the stocks you own and with the stocks that are on your watch list. This platform is best for people who really want to invest in stocks but have no idea on what to do. Acorns links in with your bank accounts so that it can monitor the pattern of your spending and purchases which will then be transferred to your Acorn account to be utilized for investment. There is also an option where you can do the transfer manually so you won’t have to worry about anything. ETNA is a mobile trading platform for both brokers and digital advisors. ETNA is designed for a suave integration which has a customizable layout and pre-set themes, including data streaming, option chain, and price alerts. There is a wide array of offers that ETNA can give depending on your needs. 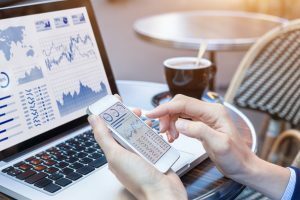 With mobile trading, there are indeed a whole lot of options from beginners to those who have already advanced knowledge in stock trade and investments, all you have to do is to know where you put your money in to.